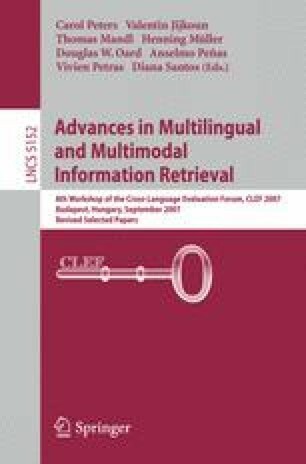 This article presents the first participation of the CINDI group in the Multiple Language Question Answering Cross Language Evaluation Forum (QA@CLEF). We participated in a track using French as source language and English as target language. CINDI_QA first uses an online translation tool to convert the French input question into an English sentence. Second, a Natural Language Parser extracts keywords such as verbs, nouns, adjectives and capitalized entities from the query. Third, synonyms of those keywords are generated thanks to a Lexical Reference module. Fourth, our integrated Searching and Indexing component localises the candidate answers from the QA@CLEF data collection. Finally, the candidates are matched against our existing set of templates to decide on the best answer to return to the user. Out of eight runs submitted this year, CINDI_QA ranked second and third with an overall accuracy of 13%.